Cobolt AB introduces a new wavelength of 553 nm on the Cobolt 06-01 Series of plug and play CW lasers. The 06-DPL 553 nm (diode pumped laser) is available with up to 50 mW and offers direct intensity modulation (analog and digital) at up to 5 kHz. 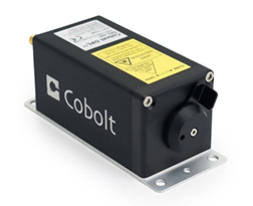 Product Name:- Cobolt AB introduces a new wavelength of 553 nm on the Cobolt 06-01 Series of plug and play CW lasers.